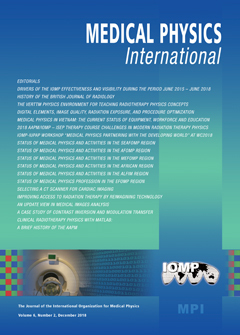 The goal of the MPI is to publish manuscripts that will enhance medical physics education and professional development on a global basis. There is a special emphasis on general review articles, reports on specific educational methods, programs, and resources. In general, this will be limited to resources that are available at no cost to medical physicists and related professionals in all countries of the world. Information on commercial educational products and services can be published as paid advertisements. Research reports are not published unless the subject is educational methodology or activities relating to professional development. High-quality review articles that are comprehensive and describe significant developments in medical physics and related technology are encouraged. These will become part of a series providing a record of the history and heritage of the medical physics profession. Manuscripts that are reporting on research results and require scientific peer review are not within the scope of the MPI and should be submitted to other established journals. Manuscripts shall be in English and submitted in WORD. Either American or British spelling can be used but it must be the same throughout the manuscript. Authors with English not their first language are encouraged to have their manuscripts edited and checked for appropriate grammar and spelling. Manuscripts can be up to 10 journal pages (approximately 8000 words reduced by the space occupied by tables and illustrations) and should include an unstructured abstract of no more than 100 words. Illustrations can be inserted into the manuscript for the review process but must be submitted as individual files when a manuscript is accepted for publication. The use of high-quality color visuals is encouraged. Any published visuals will be available to readers to use in their educational activities without additional approvals. Websites that relate to the manuscript topic and are sources for additional supporting information should be included and linked from within the article or as references. Only persons who have made substantial contributions to the manuscript or the work described in the manuscript shall be listed as authors. All persons who have contributed to the preparation of the manuscript or the work through technical assistance, writing assistance, financial support shall be listed in an acknowledgements section. There shall be a Conflict of Interest Statement at the end of the manuscript describing any person or organization, other than the authors, who has either had influence on the content of the manuscript or who could potentially benefit from the publication of the manuscript. • Is signed by all co-authors verifying that they have participated in the project and approve the manuscript as submitted. • Stating where the manuscript, or a substantially similar manuscript has been presented, published, or is being submitted for publication. Note: presentation of a paper at a conference or meeting does not prevent it from being published in MPI and where it was presented can be indicated in the published manuscript. • Permission to publish any copyrighted material, or material created by other than the co-authors, has been obtained. • Permission is granted to MPI to copyright, or use with permission copyrighted materials, the manuscripts to be published. • Permission is granted for the free use of any published materials for non-commercial educational purposes. Authors considering the development of a manuscript for a Review Article can first submit a brief proposal to the editors. This should include the title, list of authors, an abstract, and other supporting information that is appropriate. After review of the proposal the editors will consider issuing an invitation for a manuscript. When the manuscript is received it will go through the usual peer-review process. A special feature of Medical Physics International will be the publication of thesis and dissertation abstracts for recent graduates, specifically those receiving doctoral degrees in medical physics or closely related fields in 2010 or later. Abstracts should be submitted by the author along with a letter/message requesting and giving permission for publication, stating the field of study, the degree that was received, and the date of graduation. The abstracts must be in English and no longer than 2 pages (using the MPI manuscript template) and can include color images and illustrations. The abstract document should contain the thesis title, author’s name, and the institution granting the degree.